If you have ever wanted to turn your smartphone into a desktop experience (not just some janky lapdock thing), Samsung now has a solution for you. 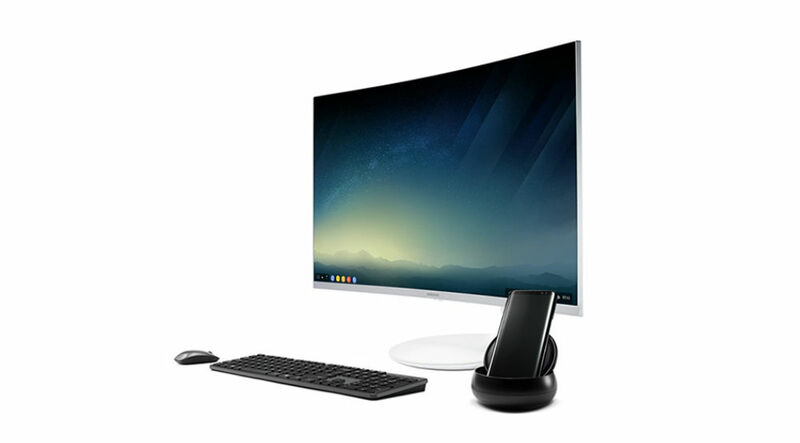 Called Samsung DeX, owners of the Galaxy S8 or Galaxy S8+ can plug into a DeX dock wired to a desktop monitor, then have a full desktop experience powered by a smartphone. To sum up what’s happening, you will place your Galaxy S8 into DeX, which is then connected to a desktop monitor, wireless keyboard, and wireless mouse. The Galaxy S8 and S8+ provide a reworked UI once hooked up, similar to what you might see on a Windows or Chrome OS desktop. Once it’s all connected, you can utilize a number of applications (web browsers, Adobe apps, etc) to get your work done, all with the Galaxy S8 and DeX. The DeX Station features two USB 2.0 ports, ethernet, USB Type-C power-in and a cooling fan. DeX Station also features Adaptive Fast Charging (AFC) to charge your Galaxy S8 or S8+ while connected. Samsung has yet to provide pricing or a release date, but does mention DeX may be offered in select Galaxy S8 and S8+ bundles, depending on region. UPDATE: Samsung is currently offering up a pre-order for DeX at $149.99 through their own store. Shipping is scheduled for April. Video: Samsung Galaxy S8 and S8+ First Look and Tour! Wednesday Poll: Buying the Galaxy S8 or Galaxy S8+?